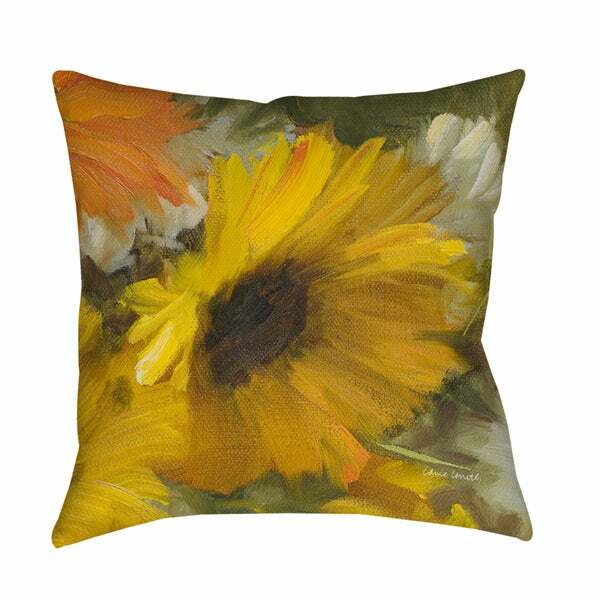 Beautiful art by Lanie Loreth creates a botanically themed design in bold orange and goldenrod on earthy green tones for this printed pillow. The face and back are made from soft woven polyester. The image is printed on both the front and back making the pillow reversible. Filled with recycled polyester microfiber, the pillow is the perfect focal point or as the finishing touch in a room. Looks good with the Thumbprintz Sunflowers Square II Rug.... Good quality. Pretty print. Love this pillow. Have lots of sunflowers around our area and I use them to decorate with. It added a punch of color for summer. I redid my bedroom, which was very tired looking with outdated French furniture. I couldn't afford to change the large pieces, so I just ignored them, and did the entire bedroom in gray and white, buying all my accessories from Overstock. But then I found I needed a splash of color, so picking up the colors from one of the paintings in the bedroom, I chose this pillow for the beautiful gray armchair for watching TV. It was the perfect "perk me up" for my gray and white bedroom! I love this pillow. It gives a pop of color to my livingroom. Much much smaller than I'd anticipated! Colors are bold and bright, however. This is real pretty and soft. Is a gift! My favorite flower and the color I painted my living room walls... Another item to tie in decor as it has white and I painted trims white. And the hues of green tie in with my light olive green sofa and chair. This pillow is for the chair. Goes with my sun-flower colors being used in decorating project. Hopefully it will fulfill my need. Very scary to order items like this when one can't see and touch plus returning can be penalized if opened. How can one see a pillow that isn't opened? I am hoping to send a GREAT review on these item!